Being new to the faceting game, for months I accumulated information that would allow me to hit the ground running when I began cutting. More than once I heard old timers tell me that a noob's common complaint was about scratches during polishing. Before getting involved, I thought all that was just about random grit particles settling on the lap. Experience has proven otherwise. In spite of a meticulously clean environment and laps, I experienced the dreaded scratching with quartz. “Scratching” is an understatement. With a 10x loupe the damage looked like deep skid marks leading to the impact zone of a plane crash. Assuming contamination, I scrubbed the lap with a bronze brush followed by cleaning it in an ultrasonic. For a while, joy. Then, it reoccured. Several times I repeated the cleaning, adjusted the lap speed and pressure on the stone, and altered the water flow until polishing eventually stabilized. Repairing the mess taught me a lot about how the machine’s cheat adjustments worked as I polished out the disaster and nudged back the meet lines. This is likely old news for experienced cutters, but for others heading into this trauma there is info available to help. The problem is more involved than you simply being a klutz. One buck will get me ten: I think your problem is subsurface scratching. The scratches usually don't show up obviously until polish stage. They're usually left by the coarsest lap and if you don't get them out with the second grind they'll come back to haunt you. Get your loupe out when you've finished the second grind or whatever second sequence you're using. Agglomeration can do the same thing but I think my first guess is more likely. 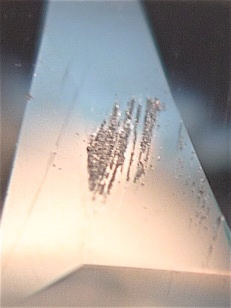 If your sequence is all diamond you'll probably have problems polishing quartz anyhow. I use AlOx on tin lap for quartz and have never had a problem polishing it -- if the subsurface scratches have been removed. I rough shape with a 600, finalize the facets with a 3000, and then go to a Greenway for polishing. The 3000 seems quite coarse for the rating. The troublesome facet was 99% perfect and I was a moment away from moving to the next facet when the surface exploded. Subsurface damage is likely the cause. I think the 600 is going to become a coaster. This pic was taken after polishing away the skid tails when it appeared like the mess was beginning to heal. Problem solved with a Gearloose Darkside lap and their cerium oxide crayon. From a 3000 grit surface, a stunning polish with no galling or scratches and it cuts waaay faster than the Greenway. I spin the lap about 500rpm and keep it just wet enough [damp] to prevent chatter and maintain a little drag, as recommend by Mr. Rolfe. he does make some great products. I have a batt lap which really works well, but I want to try some of the other laps such as the darkside. glad your getting it sorted out.